USA defeat Australia in the group c game of the 2015 FIFA women world cup taking place in Canada. Australia started the game as the stronger side but it was USA who took the lead through Magan Rapinoe in 12th minute. The goal came totally against the run of play as Rapinoe let go a great striker just from the edge of the box. Australia hit back when captain De Vanna scored with a nice left footed finish. Second half belonged to USA as they scored two goals to make it 3-1 and start with three points. Match Preview: USA women team which is also known as “USWNT” in the states will begin their campaign in Group D which is widely regarded as the “group of death” where Australia, Sweden and Nigeria will be competing for two automoative knockout sports alongside 2011 runnerups USA. Its been 16 years since USA Women team last won the World Cup which is a shame if you consider the players they had over the years. They have been ranked no.1 women’s team by FIFA for the best part of last 10 years and also won three back to back olympic gold medals but somehow they have come up short in the world cups. USA will have tough task at their hands when they play their opening fixture against Australia who are currently ranked in top 10 women fifa rankings while Sweden also in the same group are 5th ranked team. Nigeria is the only team outside top 10 ranking currently sitting at 33rd place but they are the top african team who can pose challenge to any of the top seed nations. 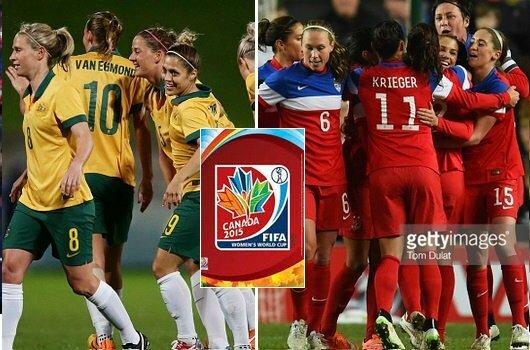 The last time both teams meet was back in October 2013 when USA defeated Australia by 4-0. USA had generaly had upper hand over Australia team since they first meet back in 1987 having won 22 times and drawing 2 matches. But Australian women team has improved alot in last 10 years and they have qualified for every world cup apart from the first one in 1991. Aussies will definitely go into the match as underdogs but USA will have to be at their best to beat this resilient Australian team. You can watch the match live on this page as we will be placing stream here 1 hour before kickoff while you can also tune in here to get the match highlights later in the night.